So. 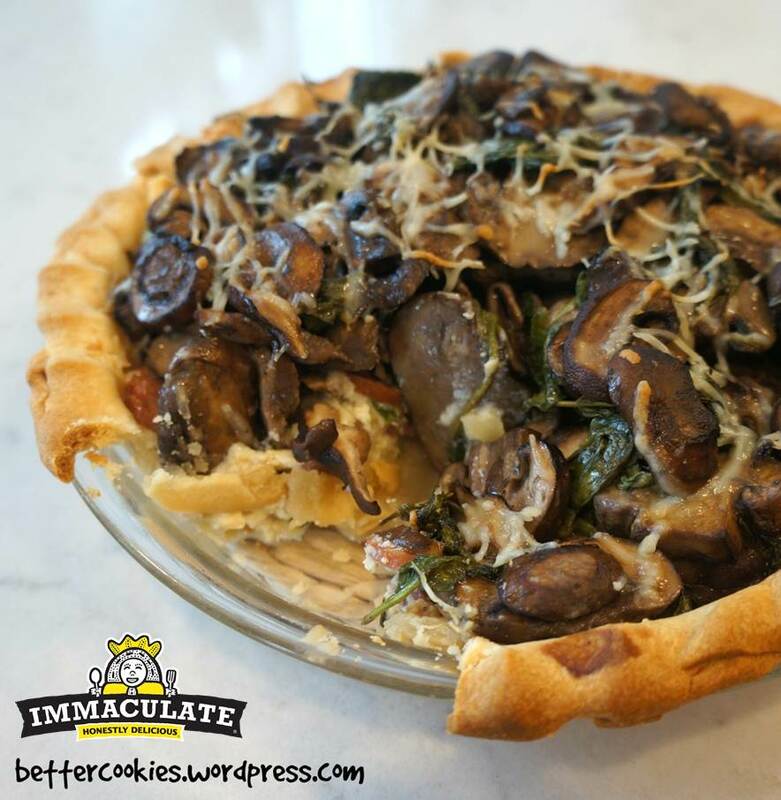 Obviously Immaculate Baking is all about natural, wholesome, non-GMO ingredients. And our fans constantly remind us of that especially when we share recipes that uses food coloring. I think it’s important to point out that there are natural food coloring, but I know, they can be ridiculously expensive. So what could The Queen possibly make in celebration of St. Patty’s Day that will stand out in a sea of recipes with neon green food coloring? 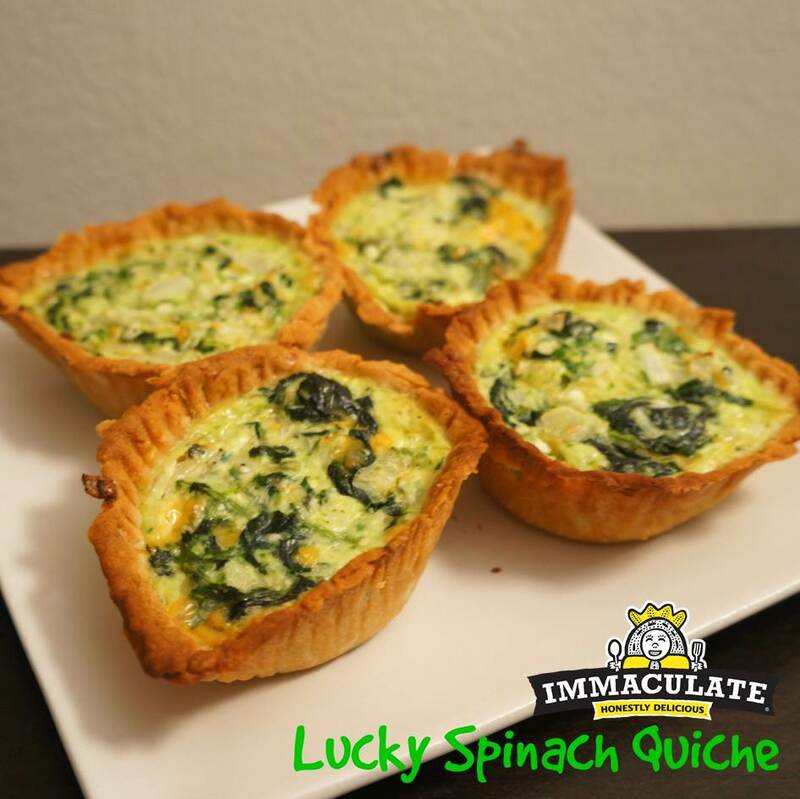 That’s when I found this awesome Lucky Spinach Quiche recipe! Yes, I admit, ever since we launched our line of flour and scratch baking dessert and cookie mixes, I’ve been a little too eager to experiment with a ton of chocolatey, fruity, or just through and through deliciously sweet recipes. I figured it’s time to change gears for the savory, after all, we can’t serve dessert until the main course has been gobbled up! And just like all of our other goodies that you’ve come to know and love, our pretzels are pretty yummy all by themselves, but just think all the other fun ways that you can put your own yummylicious twist to it (see what I did there?)! 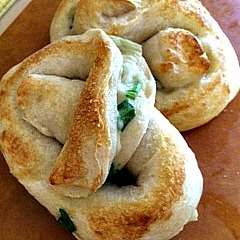 So here’s a starter idea for ya: a stuffed pretzel brimming with your favorite ingredients! Ours just happened to be spinach, artichoke and bacon! Heat oven to 400°F. Separate each roll of pretzel dough first before you unroll it into strips. Cut each strip of pretzel dough in half lengthwise, so now you have 16 long strips of dough. It’ll make the stuffing easier! Spread about 1 1/2 tablespoons artichoke and spinach dip along the length of 8 strips of dough. Top each dip-lined dough strip with one dough strip from the remaining 8. Seal tightly. Follow the instructions on the can to braid the pretzel, do the soda wash, and bake for 9-12 minutes or until golden brown. If you’re planning to make your very own Spinach & Artichoke Dip, here’s a recipe from Half-Baked Harvest! Melt the butter over medium heat. Add the minced garlic and cook for a couple of minutes. Whisk in flour until it makes a paste. Cook over medium-low heat for a minute or two, then pour in milk. Stir and cook one minute, if your paste gets too thick splash in more milk. Add cream cheese, mozzarella, parmesan and pepper. Stir until cheeses are melted. Stir in the greek yogurt until smooth. Chop artichokes and spinach and add to the sauce. Add the bacon, stir to combine. Dip will be thick, just use some muscle and stir in those veggies! I know that people tend to prefer keeping their ovens off during summer. But as I’ve been doing my recipe research, I have to say that there are plenty of yummy summer baking recipes out there! I’ve gotta believe that these summer baked goodies are so good that it would be worth heating up the house for! So I decided to put a few to the test! Tomato pies have always been something I wanted to try… but I’ve never had that great a track record when it comes to pie baking, so I figured I’d err on the conservative side and curb my ambition a little. Let’s start with mini pies that might be a bit more manageable! 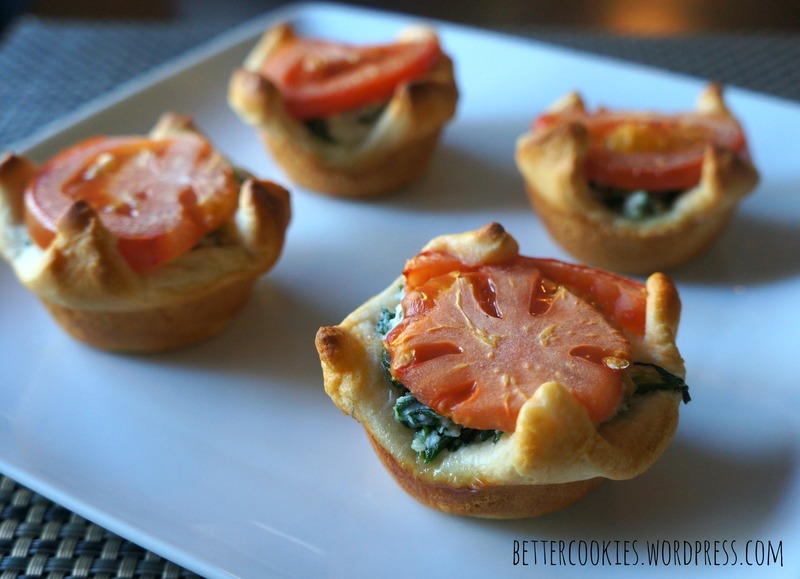 These mini tomato spinach pies are as easy as they look! Completely fool-proof (as you would know by the fact that I actually pulled it off!)! They’re bite-size, so would make for perfect summer party appetizers, and honestly they only take about 15 minutes to bake up, so the oven will be off before you know it! Besides, summer baking is why we installed air conditioners, right? Heat oven to 375°F. Spray 12 mini muffin cups or mini tart pans with cooking spray. Unroll dough on work surface; cut into 12 squares. Place each square in muffin cup, gently pressing in bottom and letting corners of dough overhang top of cup. In small bowl, mix spinach and cheeses. Add salt and pepper to taste. Spoon 1 tablespoon filling into each crust-lined cup. Top each with 1 tomato slice. Fold corners of dough over tomato. I told ya I was on a bacon roll. I knew I wanted to try more bacon recipes, but I also wanted to make sure that these were recipes that had a good veggie pairing. I’m not even going to go into all that shpill about how it will balance out the nutrition and that it’s better for you yadiyada, because all of that is true, and people should be eating their veggies for all those reasons, but more importantly, I want bacon recipes with the right veggie pairings because I honestly think that it’ll make everything taste so much yummier. 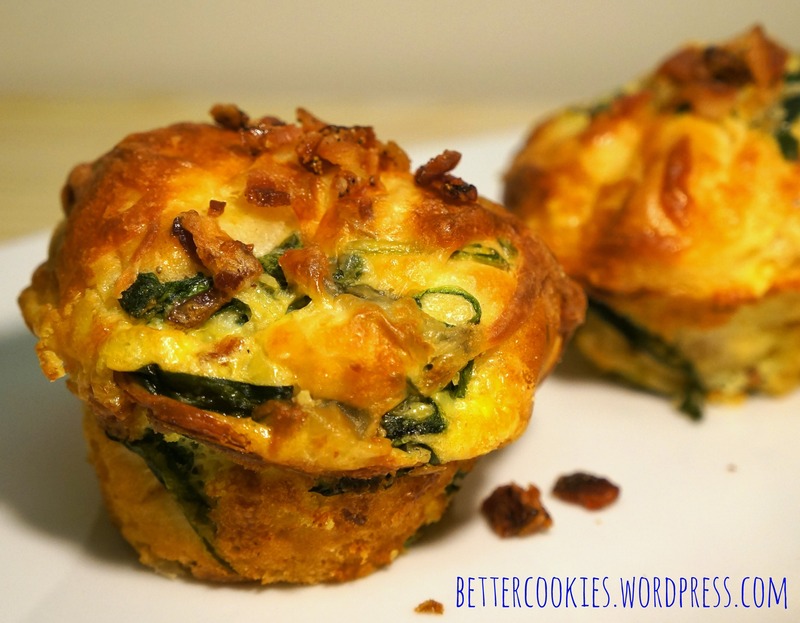 And so I give you Bacon & Spinach Quiche Cups! It’s not even Halloween yet, but it might not be too early to start brainstorming your holiday dinner menu! We’ve shared several foodier recipes on Facebook way back when it was still sunny and warm out! We thought it might be time to dust them off as many of them would be perfect appetizer options if you’re planning on hosting a little dinner party! 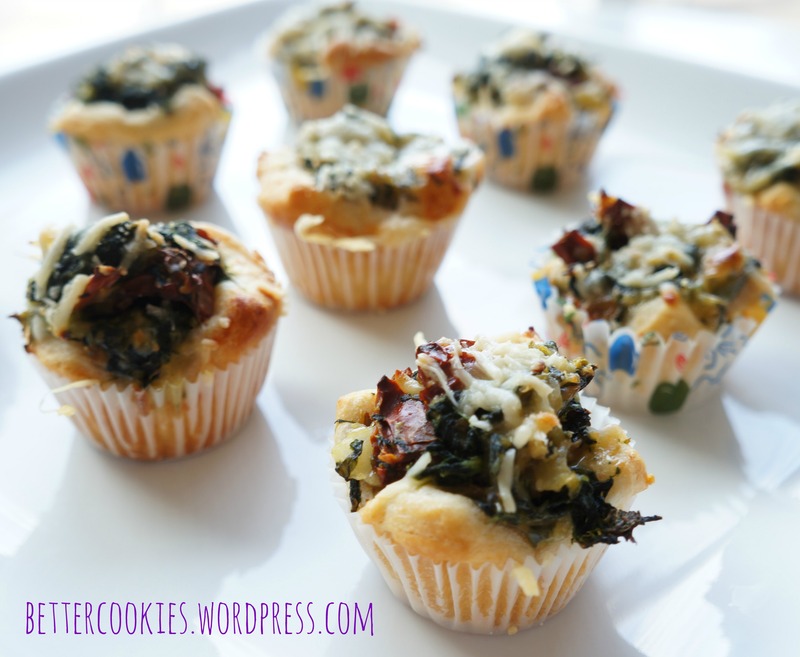 Hey, even if it’s just for your monthly book club or ladies night in, these are a few simple ideas that will definitely wow your guests, starting with this platter of Spinach Stuffed Party Cups! Heat oven to 350°F. Lightly spray 24 mini muffin cups with cooking spray. Cook spinach as directed on box. Drain spinach; cool 5 minutes. Carefully squeeze with paper towel to drain well. In 10-inch skillet, heat oil over medium heat. Add onion and garlic; cook 2 to 3 minutes, stirring occasionally, until crisp-tender. Remove from heat. Stir in spinach, sun-dried tomatoes, 3/4 cup of the cheese and the mustard; set aside. Unroll dough into 2 long rectangles; firmly press perforations to seal. Cut each rectangle into 12 squares. Place 1 square in each muffin cup; firmly press in bottom and up sides of cups, leaving corners of dough extended over edges of cups. Spoon slightly less than 1 tablespoon spinach mixture into each cup. Sprinkle with remaining 1/4 cup cheese, using about 1/2 teaspoon per cup. Bake 10 to 15 minutes or until golden brown. 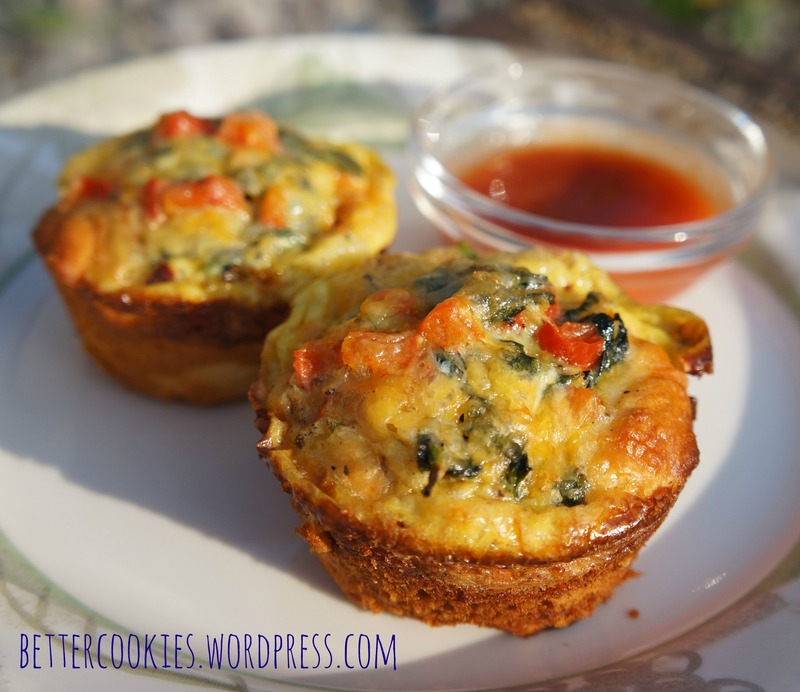 Cool 5 minutes; remove from muffin cups. Serve warm. Shredded Parmesan cheese can be substituted for the Asiago if you prefer the flavor of this cheese. Rich-tasting Dijon mustard hails from Dijon, France. Its flavor can range from mild to hot, depending on the brand.